This set of Python Questions and Answers for Freshers focuses on “While and For Loops”. Explanation: Objects of type int are not iterable. Explanation: Loops over the keys of the dictionary. Explanation: Error, objects of type int aren’t iterable. Explanation: Loops over key, value pairs. Explanation: Loops over the keys and prints the values. Explanation: Loops over the values. Explanation: Objects of type set have no attribute values. Explanation: Loops over the elements of the set and prints them. Explanation: Variable x takes the values 0, 1 and 2. set.add() returns None which is printed. 11. What is the output of the following? 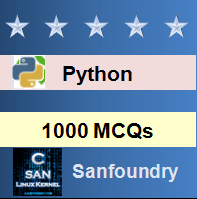 To practice all questions on Python for freshers, here is complete set of 1000+ Multiple Choice Questions and Answers.